Work life balance. Three important words we hear all the time and three words that I don’t think should ever be put together. For over 9 years now I have been running a business- one that I started myself to be the ‘master of my own destiny’ and of course to enable me to attain that enviable goal of ‘work life balance’. After a few years of working late nights, early mornings and most weekends I came to realise I had failed. Then came along my daughter and the notion of work and life and parenting and ‘balance’ took on a whole new meaning for me. Once I had my daughter, London, I knew something had to change as I simply could not work those long hours at my office the way I had before. So it was time for a new schedule- I tried working ‘part-time’ taking Wednesdays off, I would be at home, rather than at my office and I would tell myself that with discipline I would find a way to create that ‘balance’. But this time it really didn’t work. The more I tried to distance myself from my work the more stressed I became. Rather than enjoying my Wednesdays at home, they became a day I dreaded- not because I didn’t enjoy my time at home, but instead because the minute my ‘home day’ was interrupted by some sort of work task I immediately felt a sense of failure- I was unable to achieve the ‘balance’ that I thought was necessary. By compartmentalising my ‘work life’ from my ‘home life’ I thought I was creating a structure that would lead to comfort and balance but the silly thing was, the more structure I tried to put in place to relieve my stress, the more stressed I felt when it just didn’t work! Now looking back I can’t remember what changed, but something did- not overnight but over a year or two. As I started to write this blog and research all things ‘happiness’ I came to realise I was not the only one struggling to find ‘work life balance’ and I soon found that the problem for me lay within my interpretation of those three little words. There is something about the word ‘balance’ that implies evenness or a sense of equality. When I think of balance, I picture a tight rope walker with a long pole, teetering along a rope, forever trying to ensure that their weight is centered so they don’t topple off. The notion of ‘balance’ is ideal when we are trying to create order and evenness but it does not work when it comes to our daily lives. Our lives are dynamic- forever pulling us in different directions where every day and every moment is different. Some days are easy, others are fast and some days are just upside down. When we try and create a sense of ‘evenness’ or ‘equality’ between the main aspects of our lives, we quickly come unstuck when one aspect- work- suddenly takes up more time or impinges on other parts of life- ‘home’. Rather than teetering along that tightrope taking small even weighted steps I am going to encourage you to change your thinking, change your approach and lose the word balance for good. Once I added my daughter to my life the notion of ‘balance’ went out the window fast. There is nothing more levelling and challenging than those first few years of a child’s life. I learned fast that to manage a newborn I needed to go with the flow- throw away the plans and take each day as it came. And once I gave up worrying about whether work was interrupting home or home was interrupting my work I could feel the weight lifting from my shoulders. Work life integration is a phrase I can live with and that I think encapsulates what now works for me. My family, my career, my passions and my friends are the ‘big rocks’ that take priority in my life. Sometimes the ‘family rock’ is bigger than the others and sometimes the career rock takes over all of them but I have come to accept it is not about hours, minutes or days it is about understanding what matters to me, knowing things will not always be as I hope and shifting my energies and efforts as they are needed each day to make the best of my life. I have come to learn that a fixed, planned schedule full of boundaries and rules just does not work for me. Instead I have a loose structure to my week- things I know must occur- London getting to and from school, me getting through my work, all of us hanging out as a family. But there are things that really matter to me and those need to feature in my weekly schedule for me to be happy. My mind now plans in weeks or months, I don’t worry about weekends vs weekdays and I don’t limit ‘work’ to weekdays and ‘life’ to weekends. I have let go of the repeated weekly structure and embraced time as much more of a continuum. My life from the outside must look like one big happy mess of chaos and I guess it is. But that chaos has ironically created within me a deep sense of calm- something I was never able to truly feel when I was focused on ‘balance’. The secret for me to creating a sense of calm in my chaos has come from two key shifts- one in my thoughts and the other in my actions. When it comes to our thoughts, the key is to be present wherever you are. We spend so much of our time worrying about the past or focused on tomorrow when instead we need to focus on today. Over the past few years I have spent a lot of time learning about happiness and at the core of my learnings is the simple notion that the majority of our own happiness comes from within- from how we see and think about the world. By training your mind to slow down, to see the good in any situation and to be focused on whatever it is you are doing right now, you can create a sense of calm even in the most chaotic of moments in life. In those moments where you can feel your thoughts racing out of control, when you are distracted, stressed or worried just stop, be still and take 3 long slow breaths. As you do, focus on breathing in through your nose and out through your mouth, count slowly in your mind and relax. I use this technique at least 5 times a day! When my mind is racing, when I am running late, when I am dealing with a difficult person or just when I need to change gears and want to ‘speed up’ or ‘slow down’ I take 3 slow breaths, reset my mind and start again. I also find myself saying in my head (a lot) ‘just do what you have to do right now’. When I am madly dressing myself and my daughter in the mornings, preparing her lunch, while getting her to practice her readers all at the same time, you will find me breathing and chanting every 10 minutes! When it comes to our actions, we need to be aware of just how we are using our time. We all have exactly the same number of minutes, hours and days in a week but we can all choose how to use them. Thanks to our online, connected world there are more and more mental distractions available than ever before and I know myself, I have found myself getting lost in social media accounts for half an hour at a time before I realised just how much time has passed. Work out what your ‘big rocks’ are in life and make sure you give them priority- sometimes this means saying ‘no’. Sunday is the only day in the week that our family has all together- my husband’s work includes Saturdays and Sunday is precious time for us being the only clear day we have together- as such I find myself saying ‘no’ to most things that fall on Sundays. Mornings are also a debacle in our home- Oliver leaves for work before 5am and London and I hustle our way around- doing the housework, getting ready for school and work and so breakfast work meetings or anything really before 9am will also generally be on my list of ‘no thanks’. Be aware of how you are spending your time- if you say ‘yes’ to something you are saying ‘no’ to something else so be clear on the things that you want in your life- take control of them and make them your priority. Something in your life will always be pulling you in one direction or another and I encourage you to just go with it. Let your energy and concentration go where it needs to go, whatever the day. Don’t worry about whether the time you are spending in the different aspects of your life is ‘balanced’ or not. Try letting go of ‘balance’ and instead aim for ‘now’. If you just do whatever you need to do right now to clear your mind, and to be present you will start to feel a sense of calm even when things are chaotic. Life is one whole continuum and you are one whole person with many different interests, responsibilities, passions and goals. The problem with then trying to get a sense of ‘balance’, evenness or equality between the different aspects of our lives is simply that- our lives are not even, they are not balanced and so we are setting ourselves up to fail by trying to make them so. Lose the sense of ‘balance’, call it whatever you like but either way, accepting that we somethings cannot control the fun and games of life is what brings a smile to my face each day and I think has been a key to happiness. Clarissa Rayward is a Divorce Lawyer and the Owner of Brisbane Family Law Centre. over the past 14 years, Clarissa has worked with over 2000 families during separation and divorce. She specialises in assisting her clients to experience a dignified divorce- staying away from the Court process and finding sustainable agreements for the future. 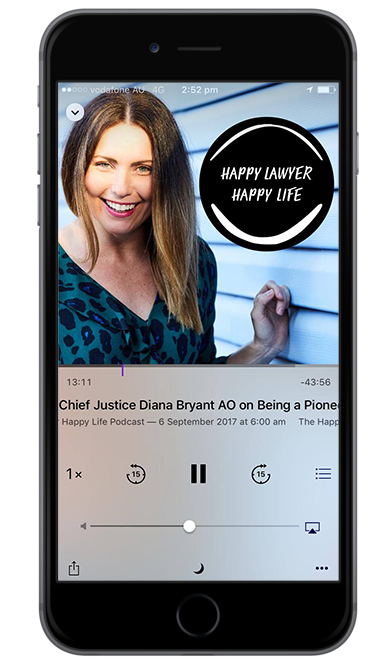 This past year Clarissa has begun to tackle the challenging issue of unhappiness in the legal profession through her writing and weekly Podcast ‘Happy Lawyer Happy Life’ where once a week she interviews lawyers who have found a way to maintain a successful career in the law while not giving up their life outside of their career. 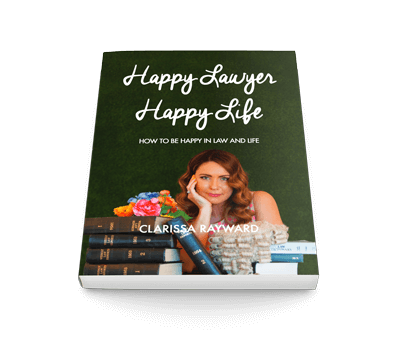 In January 2017 Clarissa publisher her second book, ‘Happy Lawyer Happy Life- How to the be Happy in Law and Life’ and launched the first ‘Happy Lawyer Happy Life’ online course, helping lawyers nationwide to better understand how they can drive happiness in their careers. If you or someone you know needs assistance during divorce you can organise a complimentary 15 minute phone appointment with Clarissa or one of her team here. You can organise order a copy of Clarissa’s Book or find out more about her Online Course and Podcast below. And if you are a lawyer like me looking to better find that integration in your life, my new Membership program ‘The Club’ might be for you!